The Greater Bandon Association has named the November recipient of its Volunteer of the Month award. Elaine Caldwell is this month’s winner as GBA begins its third year of presenting this award to the many outstanding individuals that contribute to making Bandon a better community to live in. 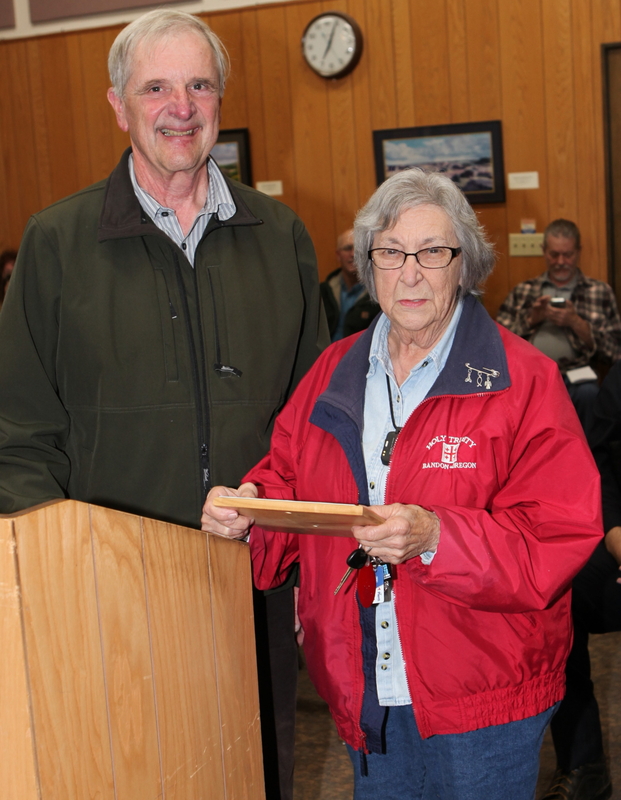 She was presented the award in the form of a plaque and a gift certificate from by Bandon Mercantile at the November 6th, 2017 meeting of Bandon’s City Council. Elaine Caldwell, long time Bandon resident has orchestrated the Blessing of the Fleet for over 30 years. Elaine managed and was involved with Tree of Giving and Toys for Tots for many years. She volunteers for the Veterans of Foreign Wars. She has worked backstage for MarLo and many kid events over the years. She has collected food for the needy and has donated her time in so many caring ways. Elaine is active at her church, Holy Trinity, and has provided endless of hours of concern and compassion to people in our community. The Greater Bandon Association will be honoring one of Bandon’s many volunteers that are making a difference in the community each month. Nominations for the November award should be e-mailed to harv@greaterbandon.org or mailed to P.O. Box 161 by close of business on November 22nd.